Despite its small size (13,000 square feet), Woh Hei Yuen provides a variety of activities, attracting everyone from the elderly to small children. Views to and from the park's adjacent streets are kept open, while park structures and planting help to define sub areas and create a sense of depth. The principal landscape area has many features encouraging exploration, including a pavilion; wood bridge over a dry creek, stone walls, and granite boulders carved into human faces and oversized fruits. Concrete and special paving link the park's main activities, as well as providing spaces for uses such as tai chi and ball play. Although the park does not see much dog use, raised curbs and low decorative fencing protect all the planting areas. Ample pedestrian scale lighting increase safety in the evenings, while illuminating the park's many unique features. The recreation center's two floors are capped with a roof deck and hold a multipurpose recreation room with a children's play nook, a 1,000 sq. ft. assembly room and a kitchen. Open every day of the week, the rec center offers programs to people of all ages, preschoolers to senior citizens. For adult residents there are drama programs, board games, ping-pong, English classes, exercise, Chinese Lion Dancing and Kung Fu. Under the watchful eye of Recreation Director Jennifer Tom, children from 11 schools and ranging in age from 3 to 14 years, gather Mondays through Saturdays for programs that include Kindergym, organized games, cooking, Chinese lessons, homework assistance, seasonal sports, karaoke, and motor skills. "Motor skills are very important for our children," says Tom, "because they have no backyards." Call for more details on the programs they offer: (415) 989-4442. 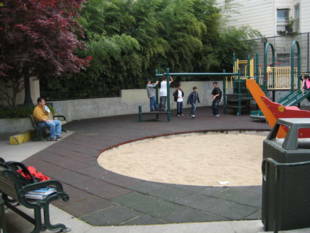 The park is owned by the San Francisco Recreation and Park Department. 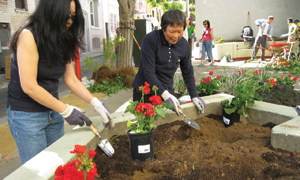 10-Townsend or 12-Folsom: Pacific Ave. and Powell St.
Its name means 'Garden of Peace and Joy,' and the 25-year campaign to bring it into being has added new depth to the words. 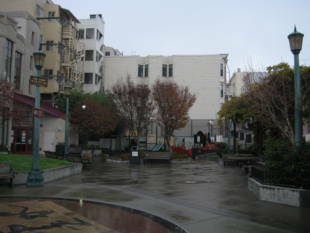 The community's call for a fourth park in Chinatown, the city's most densely populated neighborhood, began in 1974, says Terry Ow-Wing, co-chair of the Committee for Better Parks and Recreation in Chinatown (CBPRC). After years of searching, the committee found a feasible location and, as the voice of the community, proposed the site to city hall officials. In 1987, the Board of Supervisors voted to purchase a third-of-an acre on Powell Street and John Alley (near Jackson) owned by Cathay Mortuary. Following a protracted battle with the owners over sale of the former mortuary site, the city bought the property under eminent domain proceedings and the Open Space Committee provided $8.3 million for purchase in a 'high need' neighborhood. The city took ownership in 1993. Yes! Chinatown is finally getting its New Park, and our dream is now becoming a reality,' wrote Ow-Wing on the invitation to the groundbreaking ceremony for the recreation building on October 9, 1996. Declared 'Chinatown New Park Day' in a Board of Supervisors resolution, it marked the joint celebration by CBPRC and the Recreation and Park Department of the park's first phase. 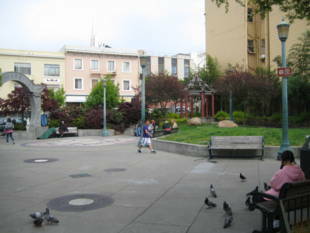 Its playground and landscaped area would follow in 1997. The Department of Public Works and the Recreation and Park Department managed the project's design and construction. The planning process, begun by the CBPRC and Rec and Park Department Planner Deborah Learner, had been underway in the community since 1991. In eleven workshops, seniors, child care providers, school children, and residents expressed their needs and suggestions which DPW architects incorporated in the initial plan. The architectural firm Murokami and Associates joined the design process, and when it was finalized, DPW's construction crew and Lem Construction raised the $1.6 million building. Lion dancers from the SF Police Department and the Wu Yee Children's Services celebrated its opening on October 7, 1997. 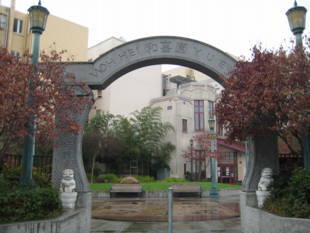 Chinatown New Park was now officially Woh Hei Yuen, the winning name in the community's 'Name the Park' competition held earlier that year. With the recreation building up and teeming with activity, work began on the plan to turn the park's 11,500 square feet into a tranquil retreat. Today, visitors walk through a handsome arched gateway of sculpted granite into the 'garden of peace and joy,' dotted with slender trees. Trellised seats are sheltered by abundant vines; a wood bridge spans a dry creek in one corner of the lawn, flowering bushes brighten borders. In the corner play area, a round sandbox, sturdy climbing structures and slides, shiny plastic cars and tricycles beckon youngsters. Call the rec center for more details on the programs they offer: (415) 989-4442"